Interested in recipes, food news, & more? Ah, Brooklyn. Beloved home to hipsters and cool kids. Flannel and beards. And, well, that’s basically all I think I know about Brooklyn. I’m no frequent-flyer, so my real-life experience of Brooklyn is pretty limited, but honestly I’d probably love it. Since 1880, The Brooklyn has defied any sort of standard. Numerous attempts have failed to match the simple grandeur of the Manhattan. Of course, the Manhattan’s simplicity is also the force that has made it a standard. 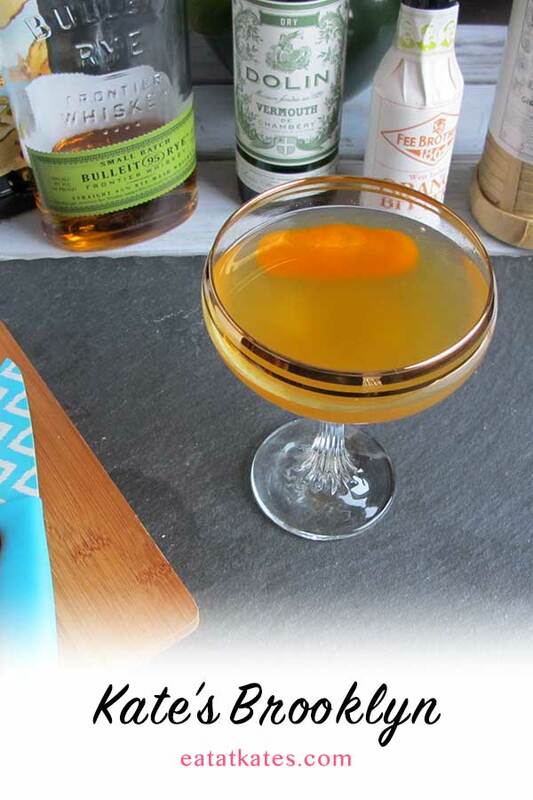 It requires only three ingredients: whiskey, vermouth, and bitters, which can be found in almost any home bar. The Brooklyn is more complicated, and requires a (very) well stocked bar, but if you’ve got the makings, I think you’ll find it a suitable aperitif. The most common ratio I’ve found (from Serious Eats, Chowhound, & The Kitchn) is roughly 2:1 rye whiskey to dry vermouth with small portions of amaro and maraschino liqueur (not to be mistaken for maraschino juice) added. Here, I’ve adjusted the whiskey:vermouth ratio to soften it and punched up the herbal flavors by adding a bit of fresh orange juice. This delightful article by cocktail historian David Wondrich in Edible Brooklyn that also includes a link to some of the intriguing variations he mentions. This article in Punch by Kara Newman which points out that the majority of the current Brooklyn variations were cobbled together in… Manhattan. Take that for what you will. The Brooklynite | eatatkates.com – A bright, citrusy cocktail that balances bold rye whiskey, herbal vermouth, and bitter amaro with light, seasonal citrus. In a shaker or cocktail glass filled with ice, add all ingredients. Stir well until thoroughly chilled. Strain into a chilled cocktail glass and garnish orange peel. If you’re a dedicated cocktailer, I recommend Dolin Dry Vermouth. It’s a few bucks more than other brands, but worth it. It will keep best if refrigerated after opening. Welcome to Eat at Kate's, where it's not just about delicious food and drinks, but also about what we chat about around the table together from life, family, and events to the books, movies, and music we're digging. I send out weekly newsletters with recipes, blog posts and links to what I'm digging (or find amusing). I never share your email address! Check out what (and where!) @EatatKate's been eating. I'm a sucker for comfort food. Basically, anything that can be eaten from a bowl or between two slices of bread. I write about food, dining out, books, movies, TV, and music.